I have had this book on my mind for six months – I have always felt there was a great need for a book that pulls all the No Poo information out there together in one easy place- but it was only at the start of July that I decided to crack on with it. Cue late nights typing furiously and whole afternoon’s spent eyeball-deep in CHEMISTRY of all things. Ugh. I had to, like, figure out science for this thing. In fact, that is the section I found most fascinating – the Science of No Poo. Because it isn’t just some hippy poppycock – it is a proper, legitimate process that genuinely works. 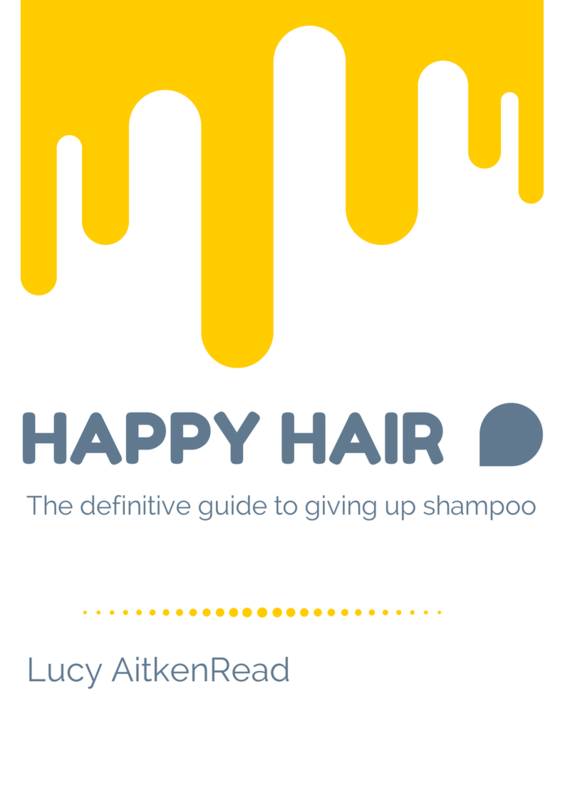 This book will help No Pooers get through the transitional stage, find an alternative that works for them (there are over THIRTY alternatives to shampoo, conditioner and styling products) and gives solutions for common problems encountered. There are several pages answering Frequently Asked Questions covering hair dye, hair straighteners, hair types, exercise, swimming, headlice amongst other glorious things. And lots of testimonials and funny stories. And so, on to buying this ultimate guide to No Poo. (ARGH, WHY DIDN’T I CALL IT THAT?! That’s a good name that. GAh.) The very best way to get this book is as a simple Ebook from my Estore – of which I will get EVERY penny! It is a PDF so you open it up and read it in your Kindle just as you would normally, or on your phone or Ipad or simply read in on your PC. Add to Cart, yeah? And all for less than a bottle of good shampoo. Perhaps you might even be the first person to review this book?! (Please do!) Head onto Amazon to do that. And if you can share the book all about with your mates/ any journos you know I will come and nuzzle my nice smelling, clean No Poo locks into your shoulder in a succulent internet cuddle. And, feel free to join a whole load of No Pooers on my Facebook Page where we can share stories and answer questions. Please come and join in the fun! And muchos, muchos gracias for all your support so far, you have all really encouraged me through this whole book thing. Yay! I think a no poo post may have been the first one I read on your blog. Either that or nappy-free. Crunchorama. Hoping there’s info for curly hair in here…. Amazing timing! I haven’t visited you for a while, and just popped in tonight. I have been washing my hair with baking soda for a month now, and I do remember reading a no poo post of yours way back which helped my thought process. Would love to learn more, I guess I know where to go…. Oh, well done, Lucy! What a great achievement. Hope you earn millions at the same time as changing the world for the better! Good for you. You’ve written about something you’re passionate about. Will share. Yay – you got your book done! Well done you, I hope it sells millions of copies and will be telling everyone I know about it! Mary Keynko recently posted…How does your garden grow G’ma? Cant wait to read this! Well done, Lucy. I’ll definitely get this once I’ve got a spare 5 minutes. I find the whole no poo thing really interesting. I’ve watched a couple of videos on it and it really seems to work for people – just not sure, if I’d survive the transitional phase without giving up. I’ve been No Poo for a bit less than you.I’ll share your post for you as I think people can learn a lot from it. Fab Lucy! I’ll order a copy in the morning ! How long will it be up for 2,2? I’m 4 months into no poo and still in transition but determened. But for that price that I then pay you I’d love to buy the book. It will be there forever 🙂 Trying to undercut Amazon 😉 Hehehehe! Well done on being in The Telegraph and making the book. I’m impressed. Started no poo about six months ago now. It’s a great thing. Thanks, I will try saving a pdf first and once I’ve done that with a free pdf I’ll be purchasing! PS. I love your website 🙂 Thank you. About 30 years ago there was an episode of Tomorrows World in the UK where 5 women didn’t wash their hair and after the 5 weeks of yuck stage they all agreed that their hair was far healthier. About 20 years ago I had my hair shaved and I decided to not wash with shampoo anymore. Seeing as I didn’t have hair I didn’t have to go through the yucky stage. So when my hair grew back it was beautiful and soft, I could curl it and it would stay curled for 24 hours. It had more volume and I loved it. I did this for about 5 years. Unfortunatley I died my hair once and I had to start washing it again. I am tempted to go back to not washing. Hi, found this site via the The SMH, and thought I’d weigh in too. I’m a proud male no-poo’er for the better part of 10 years now, after reading about the experiences of English journo Matthew Parris and SHM write Richard Glover. It works! It really does! My hair (which is fairly short) was greasy and not very nice for about 4 weeks, then in matter of a few days changed character entirely to soft and (modestly) lustrous. It’s like that now, and it’s had nothing but nearly 10 years of daily rinsing in the shower. An extra plus – my near-lifelong low-level dandruff completely vanished in the first few months, never to return. Try it – you will not go back! I am a 73 year old ( US ) man living in Thailand. I enjoy a robust head of hair which I wash everyday , with just plain hand soap. Haven’t used shampoo for over a decade. I downloaded the book, but the file won’t open?? Hello! Oh, sorry about this… hmmm…. What device are you on please? Someone on an iphone4s couldn’t open it until the third try? Is it possible your computer is blocking pop ups? And can you open pdfs on there? Please email lulasticblog@gmail.com and I can send you a new link/ refund/ help! Love, love, love your new book! Thank you for writing it and sharing your knowledge. One question. The Hot Oil Hair Treatment lists coconut oil, olive oil, and coconut oil again. Was there supposed to be another oil or is this just an added line in the book by accident? Thanks in advance. I didn’t know how else to contact you. OOPS! MISTAKE! Thank you for point it out I will change right now! It is meant to be almond oil or another oil of your choice… Thanks for the feedback and apologies! I just downloaded your ebook and have taken the plunge! A bit scary but most new stuff is. I’ve managed to give up sugar and processed carbohydrates this year, so I figure shampoo shouldn’t be too hard. What will happen if my hair is shampooed 6 times a year at the hairdressers? Do I have to start the no poo process all over again each time?! My method is to call them up and explain what I do over the phone, then that day I do a good alternative wash & condition and they just wet it to cut it. Each time I have done this they have been very relaxed about the whole thing. Thanks Lucy. I’m taking my son to have his hair cut this afternoon, so I’ll talk to my hairdresser. He’ll no doubt notice my less-than-clean locks anyway and ask what on earth I’m doing. I’ve been going to the same hairdresser for about 20 years so we’re pretty good friends now! Having my hair cut isn’t the issue, it’s about removing all the chemicals they use to colour it. And, don’t tell me to do it myself with a natural product. That is WAY beyond my abilities. Now that I’m 45, there’s no denying the grey and I would make a real botch of it if I tried the DIY thing. I’m on day 12 of going no shampoo after seeing about your book on out national news program in New Zealand a couple of Saturday nights ago and buying it. It’s going well but I’m interested to know what the signs are when you reach ‘nirvana’. Does it happen just after you ‘shampoo’ or can it be a brush day or water wash day? I’m excited at the thought of the results as I have naturally curly hair and it can be frizzy at times using ‘normal’ shampoo and conditioner. Loved the book too, it’s a good laugh as well as bring informative. I’m coming up to the hair wash using Rhassoul clay. How do you prepare it, do you form it into paste with water, how much do you use of each. My hair has come right, I’m so excited. The turning point for me was the hair brush. I bought a Kent a Hairbrush on fishpond.co.nz. It’s brilliant, well worth paying a bit extra!! Hope it’s going to be better soon, even if my hair goes really well with the program. It’s the first time since I’ve begun that they are greasy. I’m 8 weeks no-poo and my hair is still a bit greasy/ almost sticky. I hope I’m nearly there as I’m soooo tempted to shampoo it. Perhaps I need to experiment a bit more with he shampoo alternatives? I did henna it using a Lush Brun dye which was fab btw and totally natural. Hello 🙂 Yep, it just seems like you are still in transition. Very normal for this to last 8 weeks plus. I’d try something else from the list and see how you get on! Lush bar sounds, well, LUSH! Hello! Just to let you know if you’re washing your hair with an egg: if you separate the egg and only use the yolk, you don’t get the scrambling problem even if you use hot water. I found that out here: http://www.ingodseconomy.com/naturally-frugal-egg-yolk-hair-wash/. I tried it at the weekend, and my hair looks great! Hi Lucy. Trying to buy rhassoul clay in nz(willing to buy online if best). Looking at websites and there’s powder, or clay or… What am I supposed to buy? Thanks. Hi Lucy. Thanks for writing your happy hair book.mive gone 10 days now and my hair is happier than ever (so far, so good). Also: Soap nuts: buy whole or powder? Hi Lucy. I love your site, so inspirational. I am thinking about buying your ebook – does it cover dandruff/itchy scalp at all? This is one of the reasons I decided to try going without shampoo in the first place. I’m at nearly 11 weeks now and still itchy and greasy as ever! Does it just never reach nirvana for some people,or is there hope for me? Absolutely does cover those topics! 11 weeks in – very typical to encounter problems, you need to try some different things. Lots of ideas in the book.